Are You About To Have A ‘Red Carpet’ Moment? If so, you need to look your best. If you have a wedding, family reunion, big trip or a special event coming up, a ‘Red Carpet Peel’ will have you looking refreshed and glowing. If you aren’t planning anything in the next while, treat yourself anyway and rid your skin of the havoc the summer heat can wreak on your precious skin. A ‘Red Carpet Peel’ is a revolutionary beta/alpha acid peel that stimulates skin cell turnover, reducing any fine lines and wrinkles. We like to call it the Red Carpet Peel because your skin looks ready for Hollywood after a treatment! Fast-tracking cellular turnover, the Red Carpet Peel eliminates dead skin cells which sit on the surface of your skin, leaving a tired and rough looking complexion. It delivers a cocktail of ZO antioxidants and sun protection to encourage healthy new skin cell growth and inhibit melanin production. Restore overall skin tone, texture and smoothness. 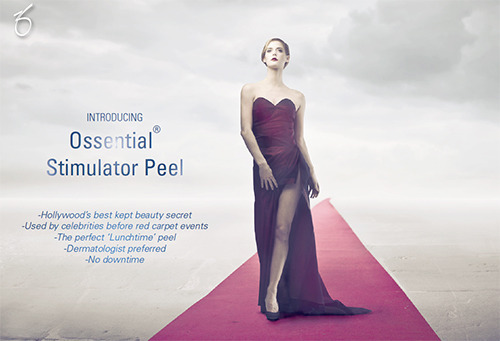 The Red Carpet Peel or ZO® Ossential® Stimulator Peel Treatment Total is used by renowned Dermatologists for their celeb clientele before their own red carpet events.